According to the description of the movie, the two risk not only their lives, but their faith and their very souls confronting a malevolent force in the form of a demonic nun. Apparently, they also learn of the convent’s unholy secret. Stop degrading the Catholic Church and the Brides of Christ! Looking at screenshots of the movie, the scenes portray cloistered life as scary, dark and sinful. This is absolutely the opposite! 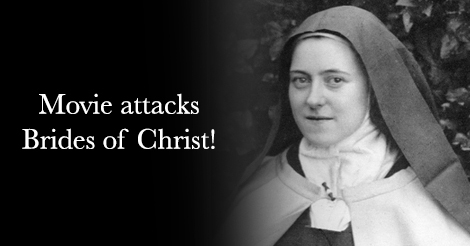 A nun, a bride of Christ is anything but dark and scary. Being a nun is bright, beautiful and honorable. The Nun is an attempt to disfigure the Catholic Church and portray Her as dark and evil. The last thing we need is an image of the Church portrayed as demonic. The Holy Catholic Church fights against Satan and all his works and promotes all that is of good, true and beautiful. Stop bashing the Holy Catholic Church! To: Kevin Tsujihara, CEO of Warner Bros. Your movie, The Nun is a terrible attack on the Catholic Church and consecrated life. The Nun portrays consecrated life in a convent as dark and evil. Being a nun, a bride of Christ, is anything but dark and scary. It is a great honor! Finally, it is completely unacceptable to include a scene where a character flirts with Sister Irene. I strongly demand that you cancel the movie and stop bashing the Catholic Church.